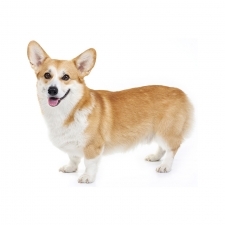 The Pembroke Welsh Corgi make excellent family dogs as they are playful, gentle and friendly. They are people-oriented and love to be with their families. They are great with well-mannered children, but you’ll need to watch them carefully because Corgis tend to herd children by nipping at their heels. Corgis are very intelligent and are quick learners. They enjoy it when they have a job to do, which is why they thrive on farms. However, given the proper exercise, they can thrive anywhere. Pembroke Welsh Corgis are usually very protective and vocal which makes them very good watchdogs. They seem to be in tune with their owners and are very sensitive to their moods. They are enchanting little dogs who love to play and are rarely destructive. Corgis usually weigh between 25 to 30 pounds and stand approximately 10 to 13 inches tall. They are a medium-sized dog with a sturdy body on short legs. Pembroke Welsh Corgis have no tail. They have short hair and their color ranges from black and tan to fawn. According to Welsh legend, the Pembroke Welsh Corgi came from fairies and elves. As the story goes, one day two children were tending their family’s cattle when they found a couple of puppies. The children thought they were foxes but didn’t know for sure and took them home. The parents told them that they were puppies and were a gift from the fairies that lived in the field, and that the fairies used them to pull their carriages and sometimes ride into battle. As proof, the parents showed their children the marks on the puppies’ backs where the fairy saddle was placed on their shoulders. This delighted the children, and the dogs became cherished family pets, and also helped with herding their cattle.